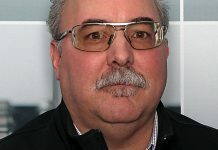 An experienced metallurgist makes the case for a finishing process that is clean, controllable, precise, and reduces the risk of distortion and surface growth. 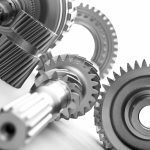 There has been much discussion regarding the surface treatment of gear power transmission systems using the nitriding process. 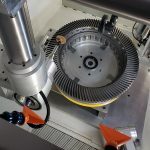 Much of the past discussions have centered on the suitability of the process results because of the potential for high surface hardness results and the impact value of the nitrided surface. 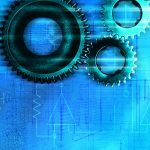 This presentation will discuss: • Materials for gears for nitriding • Process control • Process method selection • Testing and interpretation of results With these objectives in mind it is the intention of the writer to demonstrate the advantages of the nitriding process for the surface treatment of gears. The traditional methods of nitriding are based on deriving a source of nitrogen from a gas or compound. The two common sources of nitrogen are ammonia for gas nitriding, and cyanide to cyanate decomposition for salt bath nitriding. The gaseous method of nitriding is based on the simple decomposition of ammonia to its nascent forms: 2NH3 N2 + 3H2 (1) NH3 → 3H + N (2) 2N → N2 (3) 2H → H2 The atomic nitrogen and hydrogen components shown in equation 1 are unstable and will unite with other like atoms to form a molecular bond as shown in equations 2 and 3. It is while they are in the atomic state that diffusion will begin to occur. 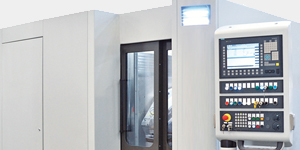 Nitriding temperatures are low in relation to most other surface treatment procedures. 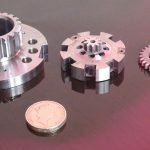 Gas nitriding temperatures can range from 486° C to 550° C. This, of course, will be dependent on the steel’s pre-heat treatment and core hardness. The major advantage of the low temperature procedure is that of reduced distortion. 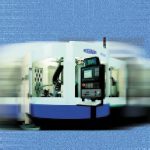 That is not to say that distortion will not occur, because it will occur in terms of growth and induced stress machining. However, the growth is uniform in all directions and is dependent on the total case depth and the thickness of the surface compound layer. 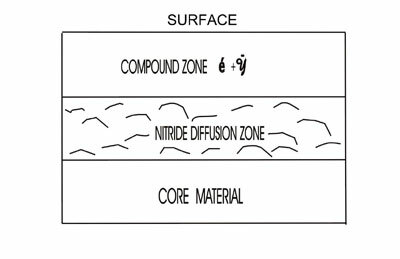 Plasma nitriding, on the other hand, offers a greater control on the thickness of the compound layer, which means greater control on growth. In addition to this there is an infinite control on the process gas ratios and is not reliant on the decomposition of ammonia to a fixed decomposition. This means that one has control over the composition of the compound layer, as well as the nitrided diffusion zone’s. 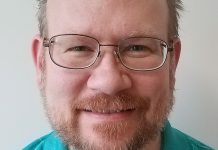 In defense of gas nitriding there is, of course, the dilution method of control of the compound layer thickness. The dilution method is designed to use a suitable gas that will dilute the free nitrogen available for nitriding. 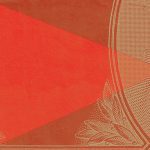 There is also the two-stage process developed by Dr. Carl Floe in the mid 1940s. This procedure was developed to reduce the compound layer thickness. The compound layer is still formed, however, and not eliminated. The compound layer is exhibited as a white colored area on the immediate surface of the nitrided steel when the sample is nital etched for microscopic examination. 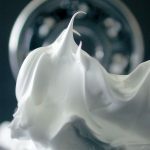 The typical compound layer is made up of two phases—epsilon nitride, and gamma prime nitride —and the phases are generally equal by volume; 50 percent + 50 percent. The layer composition will be affected by the carbon content of the steel, as well as the process gas decomposition ratios. If the compound layer is dominant by the epsilon phase, then the surface will exhibit high surface hardness values but with low impact values. In other words, the surface will be brittle and will not easily withstand high impact, cyclical load values. If the steel chemistry includes aluminum up to 1 percent, then a similar effect will occur. In this instance the diffused nitrogen will react with the aluminum to form extremely hard aluminum nitrides that are not capable of withstanding high cyclical impact loads. The failure mechanism will start with surface crack propagation, followed by the nitride case crushing, and then the nitride case spalling. 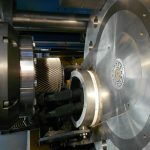 It is therefore most important when selecting a steel for gear design not to select one with aluminum present, as this will create very high nitrided surface hardness values. The “gamma prime” phase will exhibit lower surface hardness values, but with much higher impact values. The time at temperature, the process temperature, and the gas dissociation value will determine both the thickness and the composition of the phases of the compound layer when using gas nitriding. 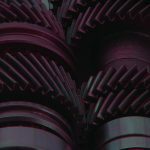 With the process of ion nitriding the time, temperature, and process gas composition are variable and can be adjusted to suit the surface metallurgical requirements of the gear. 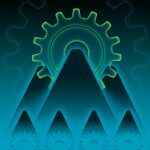 From the gear design and performance perspective, the material selection is critical to success. It has been said that in order to nitride, special steels are required. While that may be true in general, it is not critical. 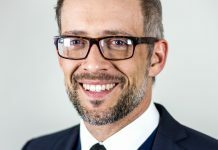 The determining factor will be how the core hardness of the substrate material will respond to the preheat-treatment necessary for case support, machining, and strength. Steel that contains one or more of the alloying elements chromium, molybdenum, vanadium, tungsten, aluminum, or silicon are helpful in forming stable surface nitrides. Iron is also a nitride forming element. It is also necessary to have carbon present in order to improve the hardenability of the core. Generally the carbon range is between 0.30 and 0.40 percent. However, the higher carbon values will tend to promote the epsilon nitride formation in the compound layer of the formed case. 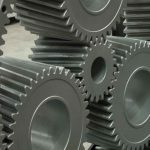 The steels that can be effectively used for gear manufacture can contain any or all of the previously mentioned elements. It must be remembered that it is also necessary to have sufficient carbon present in solution in the steel to assist in forming tempered martensite when the steel is pre-treated prior to the nitride procedure (see Figure 3). 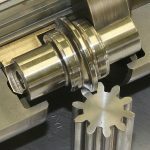 Unlike carburized gears, nitrided gears do not require significant case depths. The depth of case will of course be dependent on alloying elements, time, and gas dissociation. It can be said that the higher the nitride alloying element content, the higher the resulting surface hardness, but the shallower the resulting case. Elements such as chromium, tungsten, vanadium, and molybdenum, which are strong nitride formers, will retard the nitrogen diffusion, thus necessitating longer cycle times. 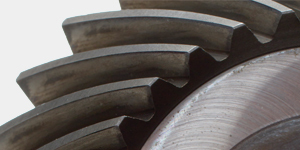 The case depth requirements are based upon the diametrical pitch (DP) of the gear. It should be noted that the stated values are based on effective case depth and not total case depth. 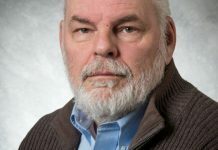 It should also be noted that the core hardness value should be of a minimum hardness value to offer support to the nitrided case, as previously suggested. 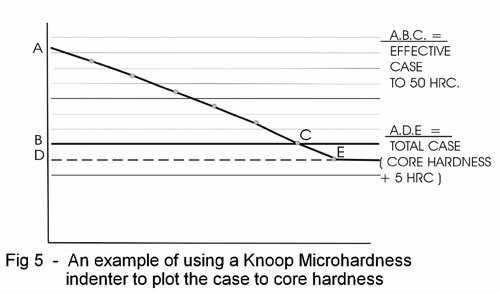 The case depth should be measured by a microhardness test unit using a 200 to 300 gram load with either a Vickers Diamond or Knoop diamond indenter. The case should be measured to effective case at a hardness value of 513 Diamond Pyramidical Number (DPN) Vickers or 50 HRC or total case. The transition zone or total case from effective case is that hardness value which is the core hardness plus 50 DPN points (or 5 HRC) higher than core hardness. 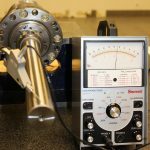 In addition to controlling the process pressure to ensure a uniform case formation, it is necessary to control the pulsed power duration. 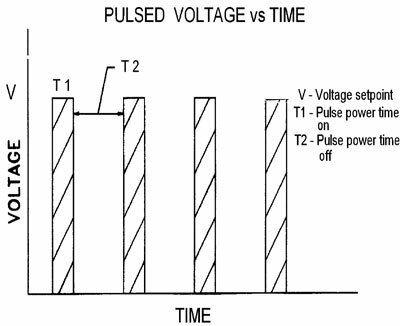 This now means controlling the following pulse voltage, pulse power duration, and pulse power off time. 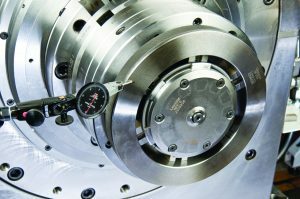 It is therefore necessary to control process parameters of the pulsed plasma Nitriding procedure accurately by the use of a computer/PLC combination. 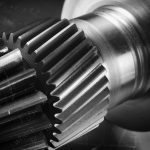 The control of the process partial pressure will ensure good root penetration of the gear tooth during the ion nitriding cycle, as well as splines, keyways, and bores. 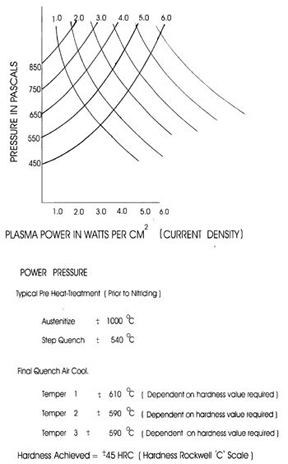 The process pressure will control the formation and uniformity of the plasma glow seam around the gear form. 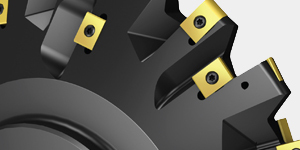 Higher process pressures will ensure that the glow seam fits “tightly” around the form. 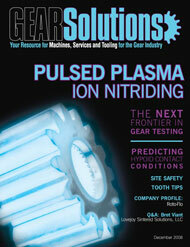 A lower operating pressure will tend to create an almost “fuzzy” glow around the gear form. The nitride effect will not be very good and will lead to shallow case formation in the root of the tooth. 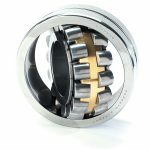 • Surface metallurgy Control of the process pressure enables the metallurgist to “push” the energy glow seam into holes, cavities, complex gear forms, and to form uniform and repeatable case formations. 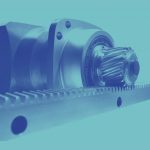 The use of the process of ion nitriding has opened the way to a more precisely controlled surface metallurgy on nitrided gears. The present use of the hot wall pulsed plasma nitriding method now allows metallurgists the ability to prevent arc discharge and over heating experienced with the traditional methods of continuous DC plasma generation. The ability to manipulate the plasma glow by partial pressure adjustment to follow the tooth profile reduces the risk of non-uniform case formation in the tooth root. Pulsed plasma ion nitriding is a proven technology that offers clean processing with no toxic effluent on precise process control, controllable surface metallurgy, and a broad temperature operating band to reduce the risk of distortion and surface growth. 1) Floe, Carl F. A Study Of The Nitriding Process Effect Of Ammonia On The Case Depth And Structure. American Society Of Materials Transaction Vol 32, 1944. 2) Pye D. The Steel Heat-Treatment Handbook Chapter On Nitriding. Totten & howes. Marcell Decker NY 1997. 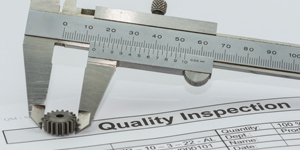 3) ASTM Quality Assurance. 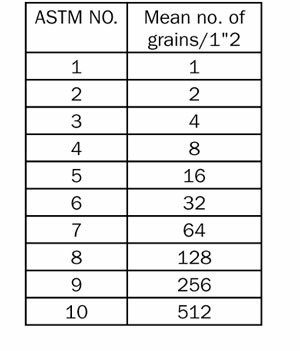 Grain Size Testing. 4) Stahlschlussel 1998. 5) PyeD. Practical Nitriding and Ferritic Nitrocarburizing published by ASM 2003.
owner and operator of Pye Metallurgical Consulting, has more than 50 years of experience in metallurgical processing. He can be reached at (814) 337-0194 or davidpye@pyemet.com. Go online to [www.pyemet.com].